I've been in Laos for 12 years, and have seen a lot of changes here. 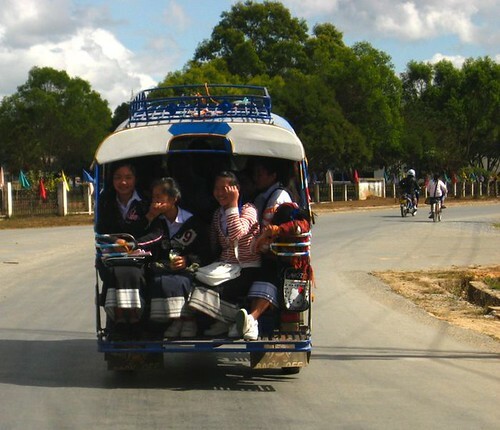 The roads in Phonsavanh, the capital city of Xieng Khouang, are all paved now. We have 24 hour electricity, and a municipal water system which pipes water into houses. There's also a different mindset. Laos is more in the world, while at the same time, preserving its cultural base. More children are going to school, especially girls. This will have a big impact on the country in the future. I cracked up when I saw these heavily leaden tuk-tuk. Inside, there were ten young women, all high school students on their way home at the end of the day. It's difficult to see in the photo, but the four girls in the back were eating sour fruits dipped in a mixture of sugar and chile peppers. I have just come across your blog. I was living in Laos until recently - unfortunately not for long enough (i was relocated for work elsewhere, unexpectedly, after only 6 months) but enough that I developed a real affection and a curiosity to see and learn more- so I will be back to read your observations!